Monday morning. David Chalian, CNN Political Director, on CNN’s “New Day” program. News ticker: “How do Trump-Russia and DNC-Ukraine compare? New Day co-anchor Alysin Camerota (former Fox anchor) puts the question to her Political Director. But wait, Mr. Political Director! (And by the way, Dave, what’s your job description? How exactly do you direct CNN’s politics? The responsibility must rest heavily on your robust 43-year-old shoulders.) What law ever made Russia an adversary? My adversary, your adversary? Was some law passed that I didn’t notice? Russia wasn’t an adversary under Yeltsin in the 90s, when the collapse of the old system produced mind-boggling misery as neocons in this country crowed about the triumph of capitalism and the need for U.S. “full-spectrum dominance” forever and ever. It wasn’t an adversary when Yeltsin bombarded the Russian Parliament building kin 1993 because legislators backed by the Supreme Court refused to disband. 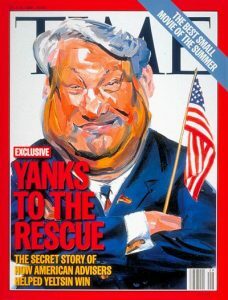 That as you know was two years before the U.S. interfered in the Russian elections to insure Yeltsin’s reelection. It wasn’t an adversary when the new leader Vladimir Putin offered assistance to the U.S. in its Afghan war, offering NATO a transport route through Russia. (3) Russia is somehow threatening the Baltic states. But these situations are never analyzed in any depth; they are simply a litany of officially mandated postulates about the past. And NATO never factors into the narrative. Mr. Chalian: Is not your primary function as CNN’s Political Director to direct attention away from any critical thinking about NATO? And to discourage attention to the fact that NATO has expanded by 13 members since 1999, to surround Russia? Isn’t it among your key functions to discourage people from wondering why this is happening, or why Russians of all stripes find this expansion a matter of concern? And to depict Russian resistance to U.S. geopolitical expansion as aggression? What sort of logical gymnastics do you have to inflict on yourself to argue as you do? And even to add to the list of Russian wrongs Moscow’s support for the Syrian state versus terrorism, in the face of U.S. efforts to topple the Syrian regime in league, as you know (you do know, right?) with al-Nusra aligned forces backed by Saudi Arabia? 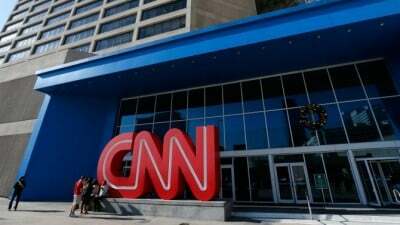 And Ms. Camerota: Is it not your primary function as CNN morning anchor to furrow your brow and roll your eyes when reading the (politically directed) teleprompter content, whenever you are reporting on anything Russian, and to exude equanimity when, as your default mode, you glorify the U.S. military no matter what they do? And send best wishes to John McCain as though he—of course—deserves them? Is that heart-felt enthusiasm for anyone’s participation in wars of aggression based on lies, or a rule of etiquette set down by the political director? Because it is a distinctly political statement. A loyalty oath you make every day, I suspect as a condition for continued employment. Pathetic. Let me “sift” through this with you. You guys in the final analysis promote war. Your promotion of Russophobia as an article of faith constitutes active collusion with the U.S. war machine. You are an active, unregistered, propagandist for NATO by default. And maybe you don’t even know it. Maybe on your own time you confuse NATO with UNESCO and for the life of you can’t grasp why any good person would worry about it. Russia is not my adversary. Warmongers and their colluders are. You are.